Introducing a fantastic, cleverly designed patented product for storing costume and precious jewelry. The Ultimate Jewelry Scroll was designed and developed by Donna Walsh. Donna is the founder and CEO of her company, Creatively Clever Solutions, LLC. This organizer does a superior job of storing, the difficult to store, large pieces of costume and valuable jewelry. The unique features of the organizer keeps all jewelry tangle free and neatly organized. Your jewelry will remain in clear view for an easy grab-n-go access. It is incredibly space saving, and holds as much jewelry as a large Jewelry Armoire! Its patented features also allow you to quickly condense an immense amount of jewelry into a small scroll. This gives you the ability to now transport an entire collection of jewelry in seconds. Setup is incredibly easy and quick. With the use of multiple scrolls, jewelry can be organized into style categories. Just layer them on the provided hooks and you can shop your jewelry collection like turning pages of a book! Available in 4 colors and styles!The Ultimate Jewelry Scroll provides a well organized, tangle free jewelry display with a convenient, at a glance, grab n go access to jewelry. It’s easy to transport and your jewelry can also be stored discretely. The Ultimate Jewelry Scroll holds over 150 pieces of jewelry! A convenient and clever way to keep your necklaces, earrings, bracelets and rings organized and safe! 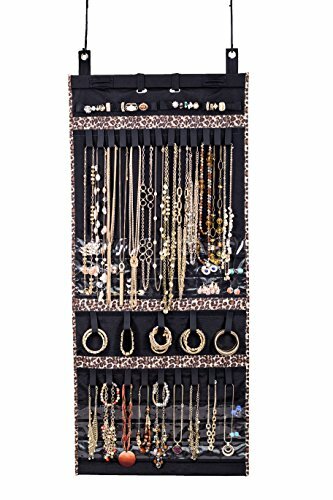 27 hook and loop holders, 42 clear pockets and 2 large ring bars are strategically situated to provide maximum storage capacity for necklaces of various lengths, as well as bracelets, watches, earring and rings of multiple styles and sizes. Jewelry can be doubled or tripled on each durable hook and loop holder. Hang it behind any door with provided hooks, or attach it to a hanger, for a superior space saving jewelry storage solution. Keep your jewelry tangle free and neatly put in order! A clear view of all your items so you can grab them and go! Easy roll-up feature keeps jewelry safe and discrete and also provides you with a clever and convenient way to quickly transport your entire collection! Perfect for air travel, as it is carry on luggage compliant!